Traveling is bliss. To leave the known behind and discover new tastes and smells, cities and landscapes is food for our minds, it lets us grow, change, and evolve. Flying into Tokyo and seeing its cityscape spread out peacefully in front of me in misty pastel colors felt unbearably exciting. It’s a place where I had never been before, a place that everybody told me would change me, and my culinary perspectives. Food plays a central role in Japan’s complex culture, food of high quality is not a random choice, it’s a philosophy, they are tied together, inseparable. I was curious and impatient to put the first bites of the country’s celebrated cuisine into my mouth, but also to wander around and fully experience the next stop of my culinary trip around the world together with Zwilling. Japan is a world of contrasts, connecting the past and the future, silence and noise, gardens and buildings, minimalism and colorful kitsch, it all exists right next to each other, framed by a fascinating culture of multiple layers, it’s not easy to grasp. Its depth is captivating and disorienting, it’s mysterious, and sometimes hard to understand for someone who comes from the outside. 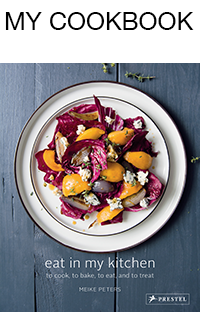 I usually visit countries for my Meet in Your Kitchen features that I’m personally connected with, either through former trips or through my own culinary upbringing. So I usually take a lot of experience, information, and understanding for a culture with me, but when you enter a world that you’ve never seen before, you can’t just look at its kitchens. 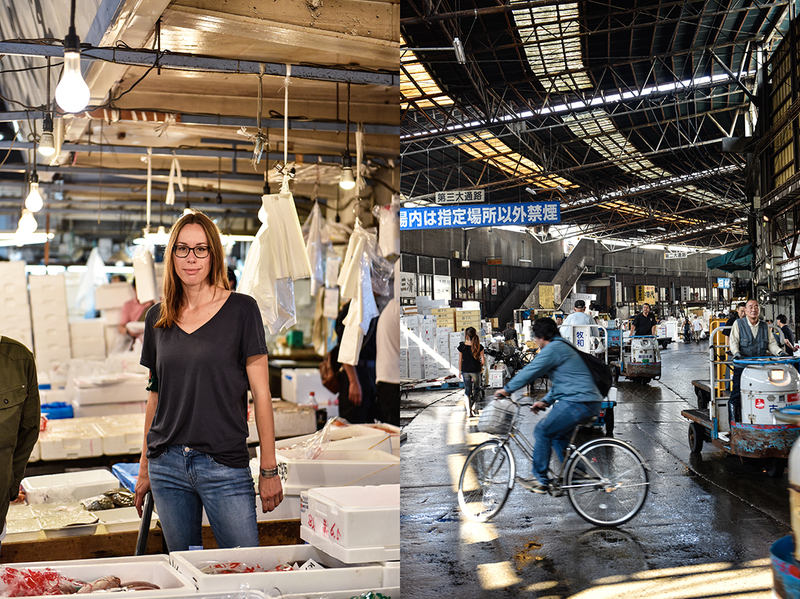 It’s not enough to visit the famous Tsukiji fish market in Tokyo or talk to the cities’ celebrated chefs and enjoy unknown culinary pleasures at their excellent restaurants. 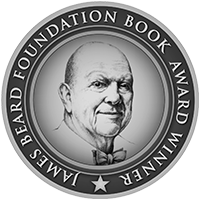 I wanted to see more, I wanted to listen to the stories – or at least some of them – that make this culture so rich and colorful, in and outside the kitchen. I joined a tea ceremony at 6 in the morning when the sun and the birds just woke up. I visited the famous temples in Kyoto, we stayed at one of them (Jorengein) overnight, and I interviewed a temple gardener to gain a better understanding of the gardens and their centuries-old architecture. I got swept away by this overwhelming peace that takes over your mind like a wave, when you sit on the wooden steps in front of the meditative gardens of the Ryoanji or Kenninji Temple. Time seems to stop as you enter the stone gardens, there seems to be an invisible curtain between the world outside and the world inside the temples’ walls. I felt a bit worried, how would it feel to be in a country where you can’t read any signs, where you can’t really communicate, or even order a taxi or book a table at a restaurant? Would I get lost in translation and miss out on the “real” Japan? I believe the best way to discover a new city is on foot, to walk and keep your eyes open, and not to be shy. Just smile, the easiest form of human communication. 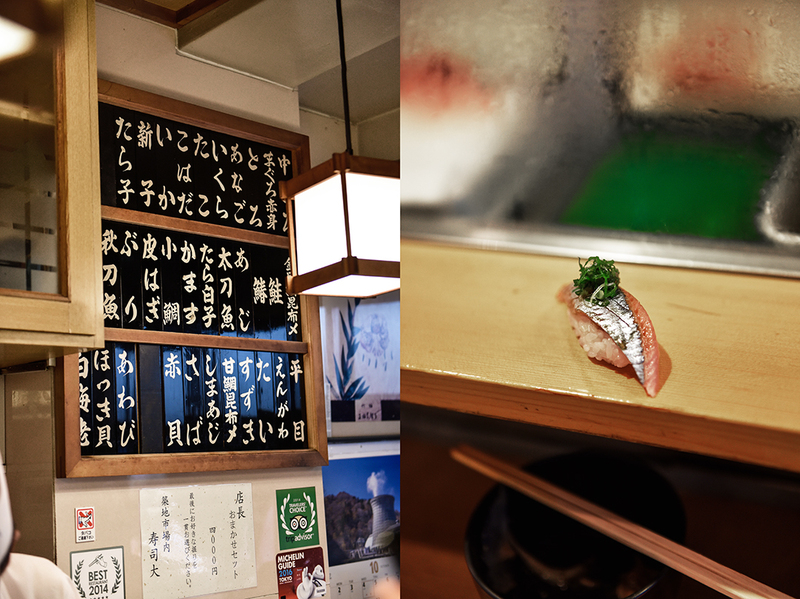 That’s what we did on our first evening in Tokyo and within seconds we found one culinary gem after the other. 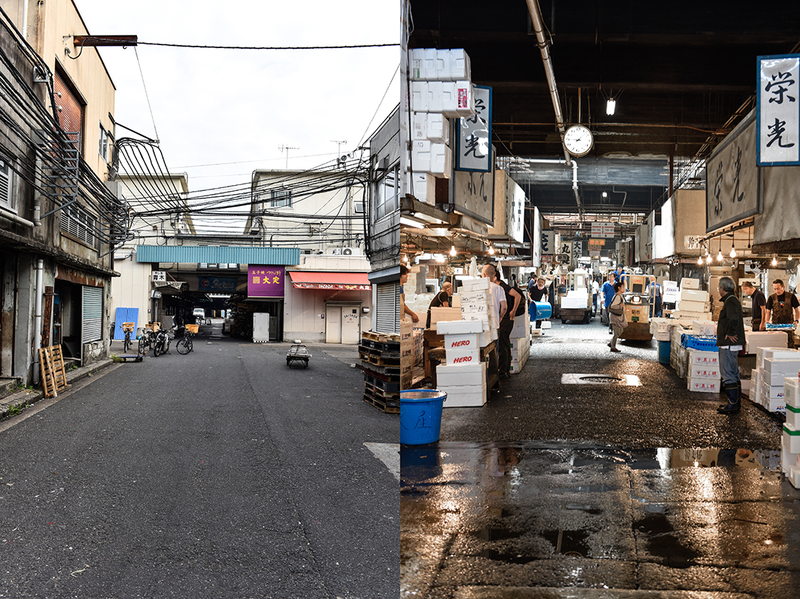 The Tsukiji fish market has its own pace, it’s fast, busy, and loud, it’s a universe with its own rules. The craziness starts late at night, at 2am. 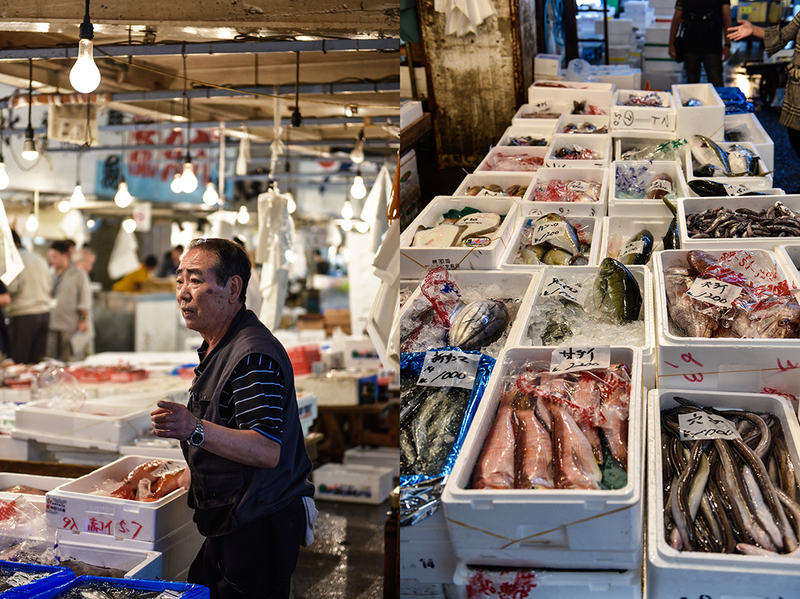 When Tokyo is still asleep and covered in quiet darkness, fishermen, chefs, and fishmongers stream into the legendary halls to buy and sell, to bid on tuna at the famous auction and ship the daily catch out into the world. The floor under the filigree metal construction built in 1935 is grey and wet from the ice, daylight cutting sharply through the skylights falls onto men in rubber boots carrying bags and boxes, running diligently, or driving little electronic carts so fast that you have to jump quickly to save your life. It’s a man’s world, running like clockwork. The world’s biggest market for fish and seafood is the heart of the fishing industry. 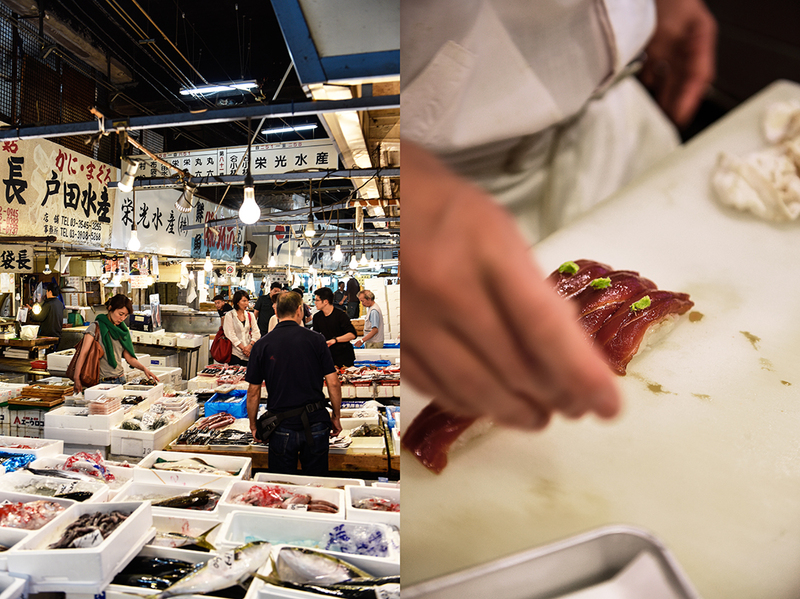 It’s the place where the sea’s treasures are rated and traded, where the best fish in the world is taken straight into the kitchens of the sushi restaurants that set up their businesses in the low buildings around the market. Yet it’s also the place where you can listen to the stories of the people who’ve been working with the sea and its gifts for generations, these people are concerned about the state of this sensitive ecosystem. The number of fish decreased dramatically and shoals that used to pass the coasts seasonally are missing. Due to global warming, summer fish fills the fishing grounds during winter and the fish that used to flourish in the cold season is nowhere to be found. There is such a beautiful and rich variety out in the seas, which we’ve always used in our kitchens, but we have to keep the balance. The fishmongers and chefs that I met all said the same. 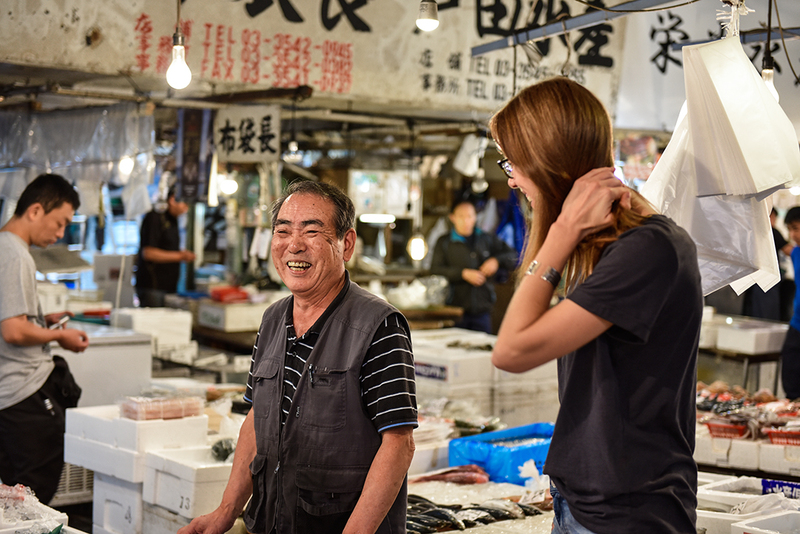 “Fish and seafood used to be a delicacy, a special treat, if we degrade it to fast food, we’re going to lose this treasure!” says Mr. Yokoyama, the owner of EIKO Suisan Fisherman fish store at Tsukiji. 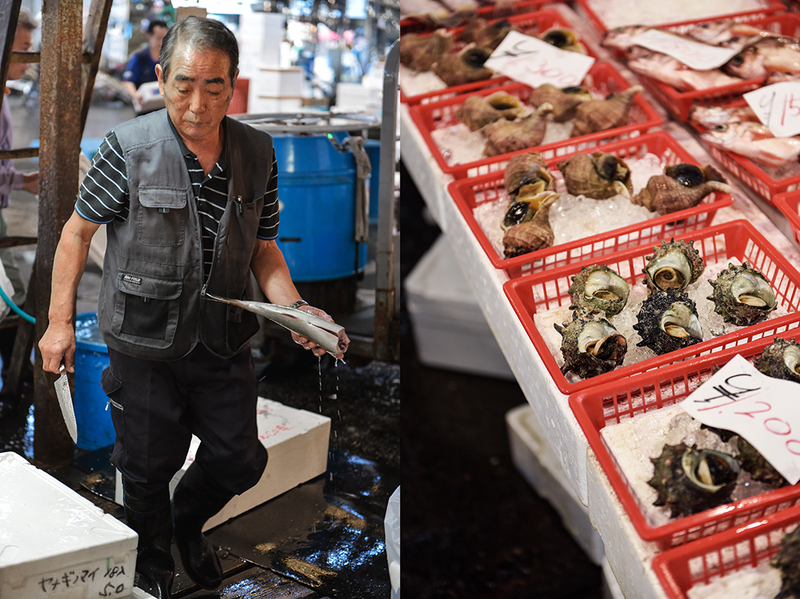 At Tsukiji, you can admire the whole abundance that nature gives us, hundreds of different kinds of fish and seafood, in all colors and sizes, mussels, crustaceans, octopus, and sazae (turban sea snail). It’s almost mesmerizing to wander through the corridors between the stalls, which makes it hard to pull yourself away from it. Going straight to one of the most celebrated restaurants in the area definitely helps. Sushi Dai is just outside the market, you can easily spot it, as it has the longest waiting list and queue lined up outside the curtains swinging at its door. Chef and owner, Urushibara Satoshi, has two outstanding qualities. There’s no doubt that he makes some of the best sushi creations in town, he learned from his father, but this man also has highly entertaining qualities. He’s like a conductor and Sushi Dai is his stage. 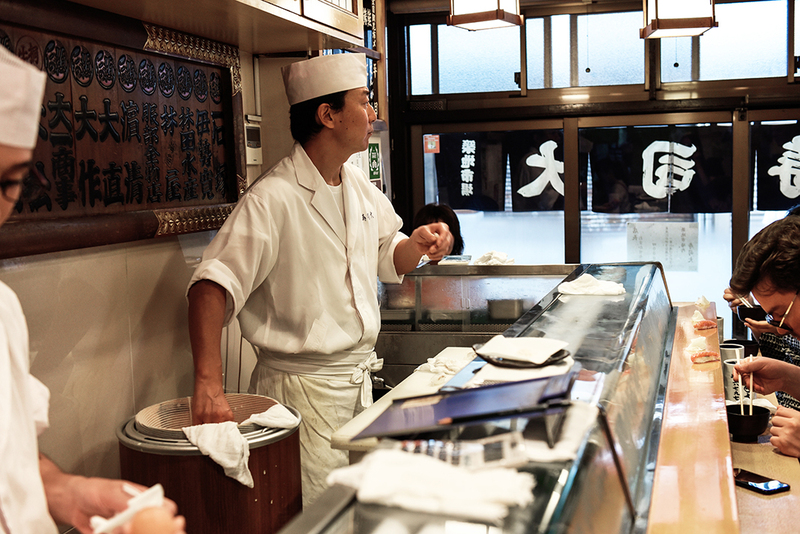 Behind his narrow restaurant’s counter, he attentively cuts the fish and shapes the rice, you can see that he was trained for more than 20 years to become the master that he is today. The movement of his hand and arm looks like a smooth dance, so concentrated yet intuitive. And this man is funny! As he placed one gorgeous creation after the other in front of us, he told us stories with the dramatic voice of an actor, you can see and taste that he truly enjoys what he does. 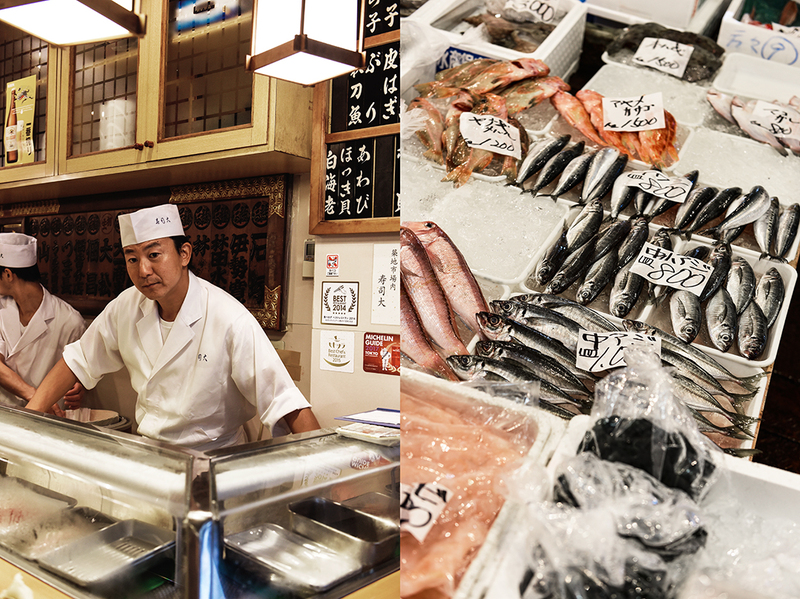 Every morning at around 3am, he goes to the Tsukiji market to pick the fish for the menu. The relationship between him and his suppliers is close. He knows that a pure minimal treat like sushi depends on the quality of its ingredients. Sushi is what it’s made of, a handful of ingredients. So trust the masterly hands of Urushibara Satoshi and his team of chefs and go for the Omakase menu. Depending on the daily catch and find at the fish market, you can indulge in the freshest tuna, flounder, and horse mackerel, or Ikura (salmon roe) rolled in seaweed. Scallops and clams, prawns and sea urchin, every piece looks like a piece of art, every bite is like tasting the sea. Thank you Mr. Yokoyama for showing us around at Tsukiji, Urushibara Satoshi for your fantastic sushi and humor, and Makiko for guiding us through your city! 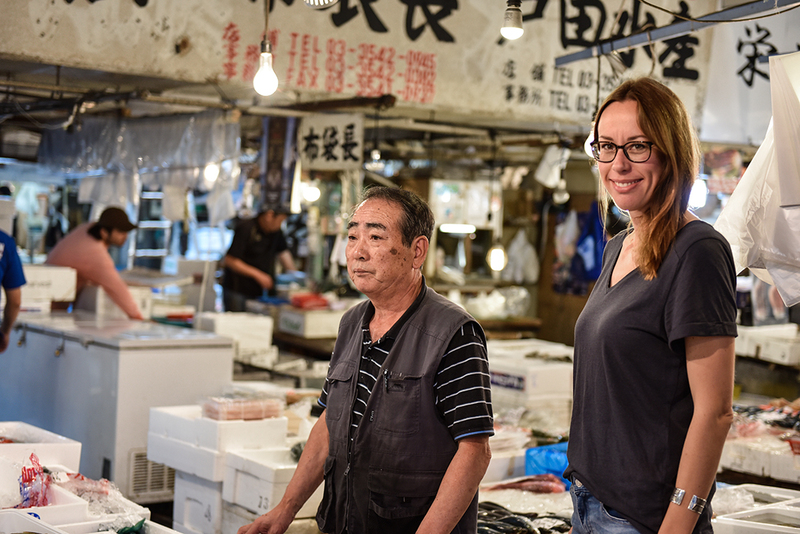 I’ll share a recipe for sushi rice with you, but when it comes to the most important ingredient, the fish, I can only recommend to go to your trusted fish monger and ask him which fish he can offer, fish of the best sushi quality. After I ate sushi in Japan, prepared by outstanding sushi masters, I don’t even bother eating it anywhere else anymore. No matter if you go for fatty tuna belly, halibut or fish roe, it has to be of the best quality. Then you just cut it into slices, eat it pure, or lay it on a bite of rice. Heaven. In a small bowl, mix the vinegar, mirin, sugar, and salt, stirring until sugar and salt are dissolved; let it cool. Rinse the rice 4-5 times with cold water, then drain in a colander for 15 minutes. In a medium saucepan, bring the rice and water to a boil over high heat. Reduce the heat to low, cover the pot, and simmer the rice for 15 minutes. Take the pot off the heat and let the rice rest for 15 minutes, don’t lift the lid. Transfer the rice to a large glass bowl. Sprinkle the warm rice with the cold vinegar mixture and stir gently, you can fan the rice while mixing, that will help it to dry, if it’s too sticky. Cover with a damp kitchen towel while preparing the sushi. Sushi rice is best at body temperature. I come to work in the morning, go to buy fish, and then I spend the rest of the day serving customers. At 3am I go to buy the fish, and then start making sushi at 4:30 am. How old were you when you started learning to make sushi? I was 18. So, that’s 27 years ago. I came to the restaurant 25 years ago. I started off making kaiseki ryori in Kyoto. For two years. Then I came back to Tokyo and became a sushi master. What made you become a sushi master? As I said, I started off in kaiseki ryori. This is a world where you can’t directly serve a customer until you’ve been doing it for 20 or 30 years, and then it’s just serving sashimi or something. I wanted to be talking to the customers. And within the world of Japanese cuisine, it was only as a sushi master that I could serve customers face to face. So, it wasn’t that I became a sushi master because I wanted to, I just had to become a sushi master. And I also just enjoyed it too. That was the first time I really enjoyed my work. I mean, with kaiseki ryori you don’t really get to meet the customers. You’re working behind the scenes, and it’s usually the women who serve the food. The chef has to stay hidden in the shadows. But I didn’t want this. I wanted to chat with the customers while I was serving them. What is your most cherished childhood memory connected to the kitchen? In the kitchen? I just used to get scolded (laughs). But ever since I was a child, I really loved cooking. I don’t know if I was any good, but I would imitate and pretend I was chopping things with a knife, for example. When I was in second or third grade, you know how everyone used to try and peel an apple in one long piece? Well, I was always top of the class in that! Also, if you’re going to be a chef, you need more than to be good at cooking. It’s most suited to someone who loves eating. More than being good at the actual cooking, feeling a real passion, and a hunger for food and eating is more important. If you don’t have any interest at all in eating, then there’s no way you’ll improve. No way. What are the essential features of a good knife for you? What makes a good knife? First of all there’s the length of the one I use. There are lots of different types of lengths. And it comes down to the weight, the thickness of the steel. At first, this knife used to be this long. But you sharpen it. So, it gradually becomes shorter and shorter. So the length and things like that are not features that last. Because the knife just gets gradually shorter. So, what else? The most important thing is that it can be controlled most effectively. I mean that it cuts exactly as you want it to. After that, the weight… Well, there are different types of people. People who like lightweight knives tend to use the strength of their arm to cut. I like heavier knives, and I use the weight of the knife to cut the fish. So, for me, I prefer a long, heavy knife. But it depends what kind of person you are. Everyone’s different so I can’t give a definitive answer. But that’s what I like. How old is your knife? I’m about 3 to 4 years into this one. On average, I would replace it after around 6 years. 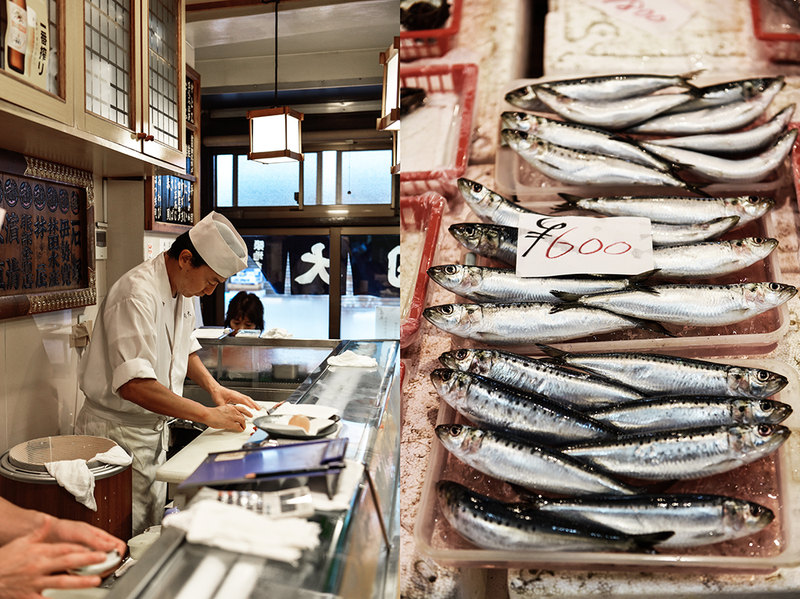 How do environmental changes affect the fish that you buy for your restaurant? Yes, it has had a huge impact. But, I don’t know if it’s the climate, or the flow of the ocean. This year, there’s the kuroshio Japan current, and the fish follow the flow of rivers where there are a lot of plankton. So, they come closer, don’t they. Then, when this Japan current approaches, that’s when we fish. But, this year it’s more erratic, so there are lots of types of fish that don’t come close to Japan as a result. So, I don’t know if it’s the temperature, or related to the flow of rivers. But there are fish we can’t catch. 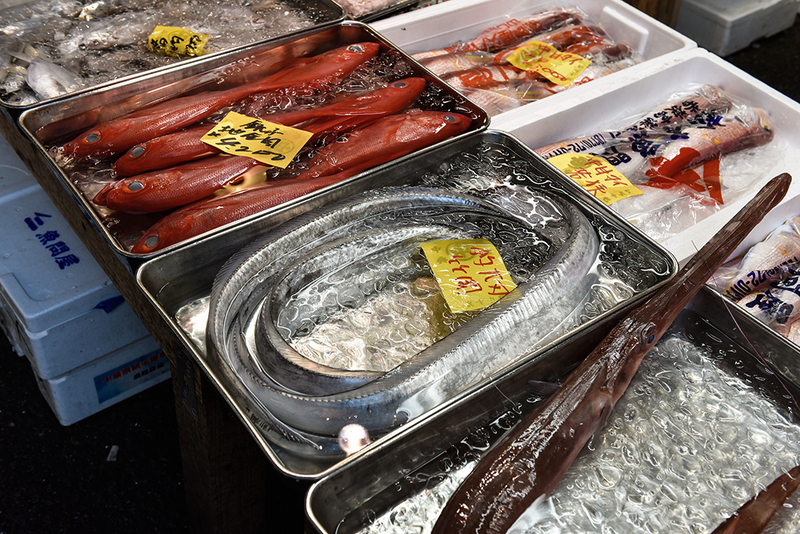 Each year it’s something different: one year might be good for yellowtail and the next year might be bad; or one year is good for saury and the next is bad; or another year might be terrible for sardines. It’s like this every year. For example, I’ve been doing this for 25 years, and each year has been different. No two years are the same. At the moment, for example, there is a lack of urchins. This year, the fishermen can’t catch any salmon, and the saury is not so good. There are so many different situations. That’s why you have to adapt each year. You just simply can’t keep making the same sushi for 25 years. The fat distribution is also completely different. I mean, completely. This is what a battle with nature looks like. So, I keep an eye on the weather forecast. And depending on the weather, you have to change the fish you stock. It’s not like we’re working in a factory doing the same thing day in day out. You also have to check whether the fishermen were able to take their boats out. So, yes, of course. I go to the market, and, of course, I buy the fish that is there. But, how can I say? There are some fish that you don’t want to run out of. So, with these, if there’s a typhoon on the way, we can stock up on them before it comes and store them while they’re at their best. There are lots of different approaches. Do you think we should change the way we consume fish? Like eating less fish? Yeah, statistically… there are graphs, according to these, there’s been a dramatic decrease in the amount of fish people eat. But, compared with when I was young, ‘conveyor belt’ sushi restaurants are really popular. So I think sushi has become something really familiar for young people. This also has made it feel like something cheap. When we were young, if you didn’t have wads of cash, you couldn’t eat sushi – that’s the image I had. So, it has definitely become something more familiar for the younger generation. So, even in and around my restaurant, we get a lot of university students coming in, even in the morning. That’s something you never would have seen in the past. How we can deal with the situation? This is something that we battle year in year out, day in day out. All you can do is do as much as you can. That means keeping going until you get to a stage where you don’t want to make sushi with the fish that is available. I don’t know if this situation will ever come. I don’t know if this day will ever come. But I just want to keep going until it does. But if it does get to a point where I don’t want to work with the fish that is available, then I will quit.